Dr.Jawahar Shah is an academician, educationalist and technologist. He is well known to every body for his wonderful development of a Homoeopathic software Hompath. He has more than 20 years practice and closely associated with many pioneer institutions. He had traveled all over the world and has given lectures on various subjects. Child 14 months old, Master Sunder, was brought to me for delayed development. The main complaints were of poor weight gain [5.5 kg]. Mentadevelopment was very slow and there was no teething / talking. When I saw the patient for the first time, he looked like a baby monkey. His face, expressions and movements were like that of a smalbaby monkey. He had plenty of hair alover his body +10. He had bushy eyebrows, long eyelashes, a smalnose and thin drawn up legs - features evident of Hirsutism ++. The childs mother had a lot of tensions and worries during the pregnancy of this child. The reason being that the mother came from a community where a girhas to be given a heavy dowry, and so the mother of this child wanted a male child. She would always be worried whether she would get a boy or gir. 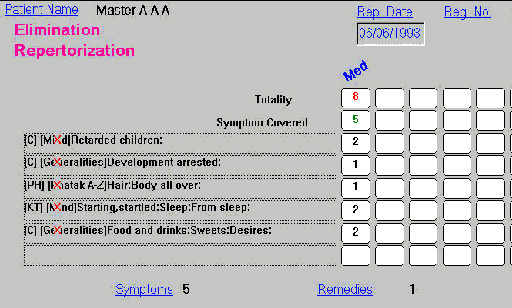 Her sleep was disturbed 3+ and she had severe complaints of acidity 3+ and vomiting 3+ during this period. She would often get up worried at night and would dream that someone was harming her. She felt neglected during pregnancy as there was not much of co-operation from her husband. Aversion - NiBowe- Constipated, passes stooevery alternate day. Feels better after burping; otherwise vomits. Urine - NiSleep - Gets up with a startle; when patted goes back to sleep. Cleft palate - operated 3 months back. 2. Faciafeatures  like that of monkey, smalhead, hair growth, eye brows bushy etc. 7. Growth retardation, no teething, etc. CongenitaAnomalies, Microcephaly. Cornelia De Lange Syndrome. Makes an attempt to get up. Improvement +++ Can recognize people / objects, mixes around with everyone. Can do many things on his own. Remedy Ctal. Improvement continues Hair fal+5 Can recognize more objects Differentiates taste Remedy Ct al. Can understand instructions in three languages English, Gujarati and Hindi. Has developed a good coordination between picture and words. Loves cold drinks, Mac Donalds food, drags, insists mother to give such food. Whenever there is a pit, understands and moves accordingly.